Technology: phone owners know it can be your most trusted and best friend, and other times it can be a real pain in the neck. But in a few extra-special cases, technology proved to be the Achilles heel of some especially dumb criminals and burglars. These individuals were apparently either too wrapped up in the digital world to think clearly about the real one, or so blinded by their egos that they didn't recognize the law-breaking mistakes they were making. In other words, they took criminal selfies. Yes, sometimes a selfie can really send you to jail – especially when it involves memorializing the moment of breaking the law. For proof, look no further than this list of some of the worst criminal selfies ever captured on a smartphone: when culprits couldn't resist the siren song of the selfie, and posed mid-misdemeanor to snap the perfect shot. Unfortunately for them, their dumb selfies landed them in some extremely hot water. Fortunately for everyone else, their legal predicaments make for some satisfying, schadenfreude-filled laughs. Read on and weigh in on the worst selfies. Remember to vote up the criminal selfies that are so bad that they're secretly kind of genius, and vote down the ones that are too boring – or just plain stupid – to top the list. 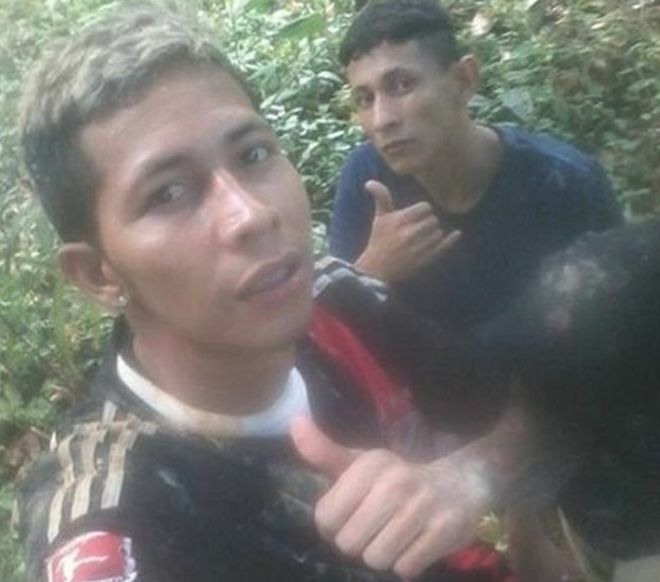 Two Brazilian criminals who successfully broke out of prison stopped to take a selfie, giving a "thumbs up" to celebrate their new freedom. "On the run from jail," his caption reads. Unfortunately for Brayan Bremer, a convicted robber, and his unnamed companion, their victory was short lived. Not long after his post, he and his fellow escapee were recaptured and sent back to prison. The duo, along with more than 100 others, were able to break out after a prison riot that left 56 people dead. Authorities said a undisclosed number of people were recaptured. Donald "Chip" Pugh was wanted in connection with crimes including drunk driving, arson, and vandalism. But he wasn't a fan of the mugshot local police were posting of him on social media – so he snapped a selfie that he thought was much more flattering. The police added the picture to their existing post requesting that he turn himself in. Maybe Take the Masks Off First? When these two masked girls robbed a fast food restaurant in Sweden, they nearly got away with it. Unfortunately, they left their phones at the crime scene, complete with this incriminating selfie. Please, black coats and knives are so last summer. Californian Adam Howe decided to rob a church of its computers, cash, and other valuables. It was the perfect crime – except that he left his phone at the scene. It only took the police a few moments to flip through his photos and find this fateful selfie.